Fitness gyms should broadcast the message that they are strong, bold, and do not back down. What better way to do this than with a black anodized metal business card? Our Stlong template is printed on a 0.5mm thick black metal stock that is unflappable. As a stock, it has a substantial presence due to its thickness. 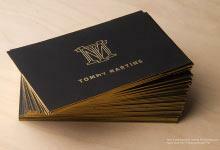 Laser engraving is used to create not only the powerful logo, but all the contact information included on the card. This design includes rounded corners that add to the professional appearance of the design and implements a layout that reinforces company branding on both sides of the card. Although this card has been designed with a fitness gym in mind, it is also versatile and can be customized by substituting your logo and company name making it appropriate for many industries including nutritionists, restaurants, and bakeries. This quick business card can be ready in as little as 3-5 business days after proof approval plus transit. Order yours to day to elevate your branding!